A well-planned vegetable garden is a productive vegetable garden, and our Garden Planner is the easiest way to create that perfect garden plan. Make the best use of the space you have, avoid wasting time or resources and start planning now for bumper harvests! Our Garden Planner helps you to plan your garden as efficiently as possible. 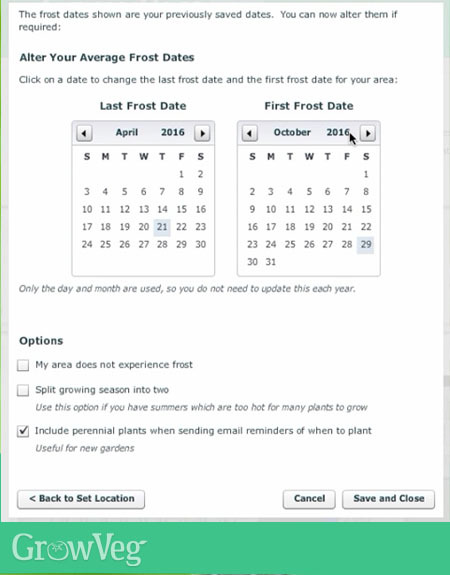 Set your location and the planner looks up your first and last frost dates, based on your nearest weather station, and uses this to recommend planting dates and estimate harvest times. The dates can also be adjusted to more accurately reflect your garden’s microclimate if necessary. If you grow in a hot climate you can split the growing season into two to avoid planting cool-season crops in the extreme summer heat. The Garden Planner can help you to lay out your garden like a pro. Draw the position of paths, beds and containers, include vital components such as compost bins and water barrels, and mark the location of growing aids, for example irrigation lines and plant supports. There are hundreds of different vegetables fruits, herbs and flowers to choose from. As you add your plants the Garden Planner calculates how many plants can be grown in that area without overcrowding them. While doing this the accompanying Plant List constantly updates to show you precisely how many plants you’ll need for each crop, their recommended spacings, and planting times, making sowing and planting accurate and eliminating wastage. Every plan which includes Garden Objects also includes a Parts List of equipment – very handy when planning elements such as irrigation that have lots of component parts. The Garden Planner enables you to plan your garden like a pro! Prefer to grow your crops at a higher density using square foot gardening? The Garden Planner has this covered too. Simply switch to SFG mode and the planner will calculate how many plants may be grown in each square foot. You can plan SFG and standard-spaced plants such as fruit bushes and larger vegetables on the same plan. Switch between SFG and normal spacings using the SFG button. The Garden Planner is a powerful tool for planning succession planting, making it easier to grow even more. Specify when plants will be growing in your garden by double-clicking on the plant in your plan then setting its in-ground dates. View your plan month by month to check where and when gaps appear. You can then use the Custom Filter button to the left of the plant selection bar to show only plants that can be sown or planted during a particular month to fill in the gaps in your plan. You can also filter crops according to crop family or for helpful characteristics such as plants that are easy to grow, shade tolerant or suitable for autumn planting or harvesting. Using the accompany Plant List you can check how adding crop protection such as a cold frame will extend sowing and harvest dates – ideal when planning early or late-season vegetables and fruits. When you pop a cold frame or other protection over a plant in your plan the Plant List immediately adjusts the period you can sow, plant and harvest, so you can plan for an even longer growing season! Create a Follow-on-Plan for next year and the Garden Planner helps you to avoid problems with pests and diseases by warning you anytime you try to place a plant in an area previously occupied by plants of the same crop family. To create a follow-on plan, first open your current year’s plan, then click on New Plan in your plan’s toolbar. Select the follow-on plan option, choose which elements you wish to copy across, then click OK.
Another powerful tool is the Companion Planting feature. This very handy tool makes it easier than ever to find perfect matches for your plants. Simply select a crop, click on the heart-shaped Companion Planting button to the left of the plant selection bar, then choose from one of its companions now displayed in the selection bar. Genius! These are just a few of the many compelling reasons to subscribe to the Garden Planner. It’s easy to get clever with your planning. And the results will be bigger, better harvests. Give it a try this growing season and see the difference for yourself!